»Culture & Arts»IDGTF 2017: Table Quiz Fundraiser & Seeking Volunteers! IDGTF 2017: Table Quiz Fundraiser & Seeking Volunteers! IDGTF 2017 is on its way! The International Dublin Gay Theatre Festival (IDGTF) 2017 are working hard putting the finishing touches to their 2017 programme, which will be announced in late March. They will present drama, comedy, music, free events, and more, from around the world, from May 1st – 14th. Keep watching www.gaytheatre.ie and Facebook for more details. 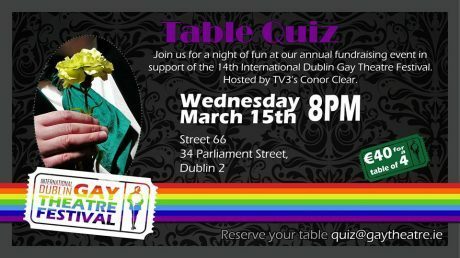 IDGTF are hosting their annual fundraising Table Quiz, in Street 66, Parliament Street (formerly the Front Lounge). Hosted by TV3’s Conor Clear, with a range of prizes on offer! Please drop by and support the Festival and their performers. The IDGTF 2017 are also Seeking Volunteers! Want to see great shows, make new friends and learn new skills? They are now recruiting volunteers for Festival 2107. If you are interested in volunteering as they begin to plan Festival 2017, you can contact them at: volunteers@gaytheatre.ie.